I am pretty eclectic when it comes to my music choice. There are very few genres that I don't like. When my friends come to sew they comment on it. They can't believe the variety that plays while we sew. Everything from Broadway show stoppers to Country. Throw in a little R&B, jazz, big band, and indie, well you get the idea. I like music. I'm also the mother of three 20 something boys. One of which is a drummer in a blues band. So when I saw the new batik line Yuki by Debbie Maddy for Moda I instantly had knew I had to do something with it. I played around with the majestic mountain block,one of my favorites to play with. After setting it running diagonal through my quilt. 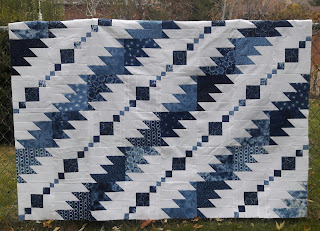 I added a chain block with varying sizes of squares and my Rhythm & Blues quilt was born. I think my little drummer boy will like it. I'm sure your drummer will love. I know I do! it's good to like a variety of music then you do not get into a rut! I love your setting for these blocks, so very unusual, good job! That turned out so cool!! and I am like you - I like a lot of variety but maybe not rap....that one still gives me headaches ha ha! LOVE your quilt! Love this arrangement and the fabrics shine. This quilt has rythmn for sure..love it! This is such a fun quilt top! I love the motion that the block arrangement creates! If you could see music this is what it would look like. I feel like dancing! I love this layout Emily! Your fabric choice was spot on. The fabric and piecing sing together in perfect harmony -- well done! 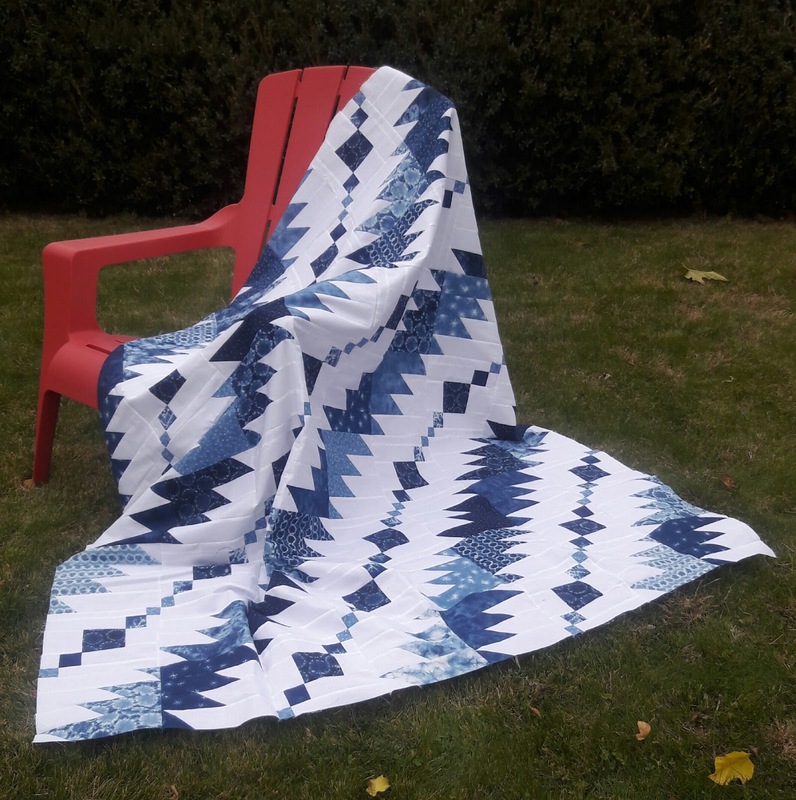 Though I'm not usually a fan of the spiky-looking majestic mountains block, or even the color blue, this quilt turns that around--it's gorgeous! Maybe a simplified tutorial, pretty please? I'd definitely make this one. Even my two blue-loving but quilt-indifferent grown sons would surely love it too. That looks fabulous. I love the chain through it too. It really does look musical somehow. I think it's in the rhythms of the squares and the jagged diagonals. Lots of movement. Beautiful!! Love the addition of the chain blocks! GREAT quilt. Yep it says Rhythm and Blues to me! Great quilt, very unique .... and such a fun name!! I love it. Beautiful colors and layout. Great name too.